Tuesdays are for Mexican food at our house, and these fajitas are a crowd favorite! 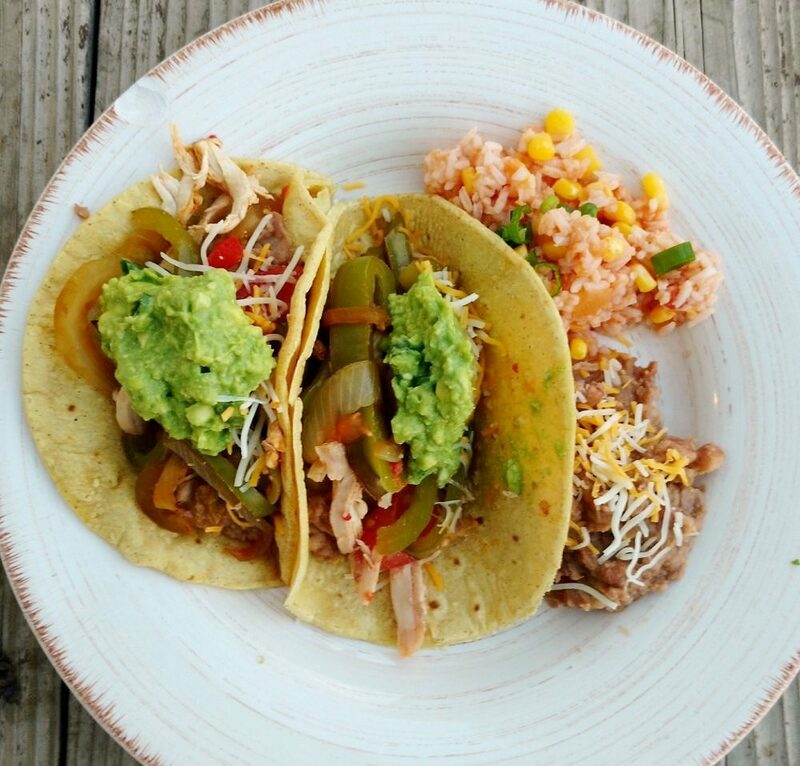 Paired with homemade refried beans and guacamole, it’s impossible to eat just one! Spray a large skillet with cooking spray and add bell peppers and onions on medium high heat. Cover the skillet with a lid. Stir occasionally. Once the vegetables are crisp-tender, add the chicken to warm through for 2 minutes. Lastly, mix in tomatoes and spices. Cover and let simmer for about 5 minutes. Prepare guacamole by removing avocado pits and scooping avocado out of the shell. Mash the avocados with a pastry blender, fork, or electric immersion blender. Mix in all other ingredients and serve immediately. 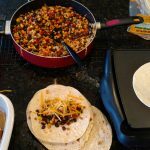 Assemble fajitas by spreading a layer of beans on the bottom of the tortilla. Scoop the fajita mix on next, and top with guacamole, cheese and Greek Yogurt. Plan ahead for this one and make a batch of Mel’s Pressure Cooker Refried Beans. Freeze beans in 2 cup servings in an air-tight container so they are ready for all of your refried bean needs. Now that school is in full swing, I thought it would be valuable to check the nutrition in foods we send our children with to school. At my children’s school there is no lunch program, so parents and students are responsible for packing lunches each day. Below are five different lunches belonging to children in grades 2-5. The data analysis was based on the nutritional needs of a very active 9-year-old male, 65 pounds and 4’5” tall. Of the 2080 recommended calories for the day, this lunch provided a third of the calories for the day. This is great. However, the carbohydrate calories provided by this lunch alone is sufficient for the entire day. Remember, the nutrients represented above are for just the lunch alone. Thus, there are still two meals of the day which will help fill in the gaps for particular nutrients. Breakfast and dinner will need to provide all of the Vitamins B12, B6, A, D, and E, and Calcium, Magnesium, Potassium and Zinc because they are all below 30% of what the child needs for the day. This meal’s pyramid is lop-sided. Replacing the Cracker Jacks with a serving of baby carrots and a cheese stick would balance the pyramid, reduce the added sugar intake, and provide most of the vitamins/minerals listed above which are lacking. Also, 15 minutes in the sun will cure the vitamin D deficiency shown. This lunch has almost as many calories as Lunch #1. However, it provides a better balance of protein, fat, and carbs. Look at all those vitamins and minerals! For breakfast and dinner, this student will need to have some extra niacin, vitamin D and vitamin E which is easily done by eating a serving of peanut butter, fortified milk (or playing in the sun), and a tablespoon of dressing on their dinner salad, respectively. A child who eats gluten-free may sometimes struggle to eat as many grains as they should. There are many wheat-free grains the child may still enjoy. I would suggest oatmeal or fortified dry rice cereal for breakfast and quinoa or rice for dinner to balance out this diet. Just looking at the macronutrient ranges of carbs, protein and fats, this lunch appears balanced. Other meals and snacks will have to make up for lack of calories. With a little more data, we can see that what appeared to be a balanced lunch is actually not providing sufficient nutrition for a growing child. The only nutrition this meal provides is a couple B vitamins which likely came from the vitamin-fortified flour in the pizza crust. The grapes provided some vitamin C and fiber and a teensy bit of folate and vitamin A, but this child will need extra nutrition from additional snacks and meals in order to balance out their day. Although the child is getting two servings of grains, the pizza rolls are not made of whole grains. It is recommended that half of the grains in a daily diet be whole. (Look for the words: 100% Whole on the label.) To balance out this lunch, I would add a serving of vegetables—red bell pepper slices, snap peas, carrots, cherry tomatoes or cucumbers to name a few ideas. Add a plain yogurt-based ranch dip for dipping the veggies and suddenly this meal offers well-rounded nutrition. Don’t be surprised if your child is completely famished upon returning from school if all they ate for lunch was a “Cup of Noodles.” Not only are there very few calories in it, but there is next to no nutrition in it either. I understand how convenient it is to slip a pre-made cup of microwavable food into your child’s bag and send them out the door—sometimes, it’s just one of those mornings! However, it is a major disservice to your child to nourish them with empty calories such as this. If you are considering eating any packaged food item which has more than 10 ingredients, and you can’t pronounce half of them, it’s probably best to eat that food very seldom. It appears that the noodles and freeze-dried bits of chicken in the “Cup of Noodles” isn’t even enough to constitute one serving of pasta or poultry. Thus, this lunch’s food pyramid is: empty. This meal sits just right at 32% of the daily calories needed for an active elementary school child. I’m not concerned about the range for carbs, proteins or fats since this is just one of several meals and snacks for the child. Check out all those vitamins and minerals in this nutrient-rich meal! Additional meals and snacks should provide milk or cheese and a serving or two of meat or lentils to balance out the day. It is important to be mindful of the balance inside of our child’s lunchbox. Most likely, we could all do better including whole grains and fresh vegetables. It’s perfectly fine to include a treat now and then, but be aware that it is the first and sometimes the majority of what your child will actually eat out of their lunchbox. I am not suggesting that parents obsess over their student’s nutrition, but simply provide meals containing unprocessed food items from at least 3 of the 5 food groups. We are doing our children a disservice when we send them to school with too many sugary snacks and drinks which give them a sugar high followed by a crash. It is too challenging for them to focus on schoolwork. Your child’s teacher will thank you for providing a lunch which helps your student behave better in class and concentrate longer on their work. 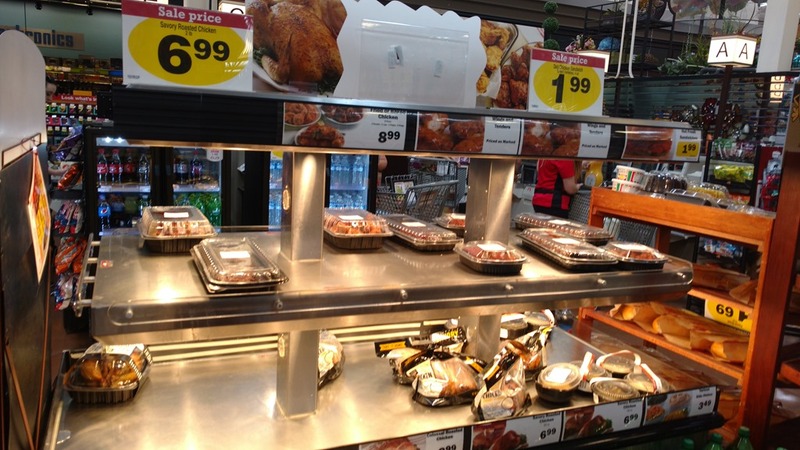 Have you ever compared the price of a raw fryer chicken versus a fully cooked, ready-to-eat rotisserie chicken? 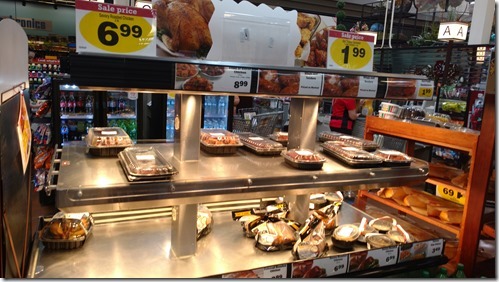 For some reason, the rotisserie is always a fraction of a price of the raw chicken. I like to get my rotisserie chickens at Costco where they cost about $5. Sometimes, I just get them at my local grocery store, but they cost about $2 more, and the chickens are a bit smaller. By the time I get the chicken home, it is cool enough to handle. I get to work with a paring knife and my fingers to peel all the skin off the meat. 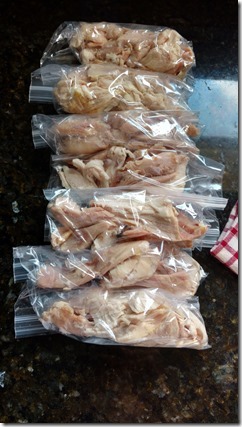 Once I have pulled all the meat off the bones, I divide the chicken into 7-8 sandwich bags for freezing. 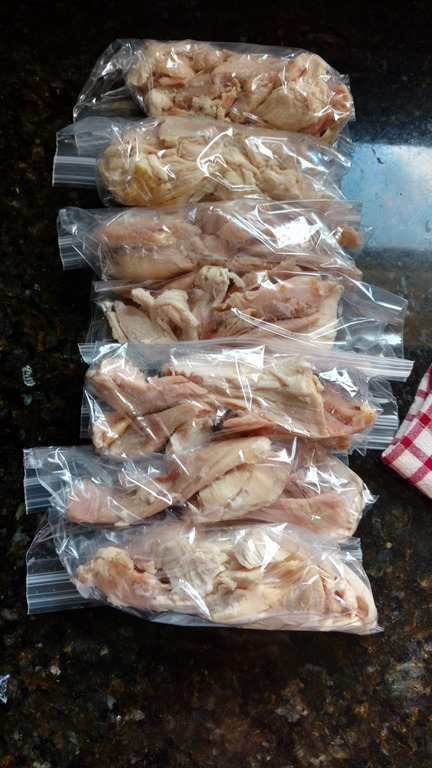 It is so handy to have a bag of cooked chicken ready to be tossed in whatever skillet, soup, casserole or salad needs flavoring and a boost of protein. Not only does it save more money than buying packaged cooked chicken, but it is healthier, too! 1) Unlike sucrose (regular table sugar) it is stable in acidic food and beverages, meaning it doesn’t go bad on the shelf. 2) It is cheap to make because it is derived from plain corn. 3) It comes in a syrup form which is quick and easy to dissolve into food products. 4) It is intensely sweet, so less can be used for the same degree of sweetness as sucrose—more bang for the buck! Structurally, both sucrose and HFCS are made up of the same two sugar molecules, or monosaccharaides, called glucose and fructose. The difference between them is HFCS is made up of un-bonded monosaccharides at a ratio of 45% glucose and 55% fructose. That’s why it is called “high” fructose. On the other hand, sucrose is a disaccharide made up of one glucose and one fructose molecule each, bound tightly together by an oxygen atom. Just an extra 10% fructose and free, un-bonded monosaccharides is all that differentiates HFCS and sucrose. So, why are so many food products getting hyped up lately, marketing that they no longer contain HFCS? Why does it have such a bad rap? I was first introduced to the properties of HFCS in a biochemistry class I took in 2008. My professor suggested that HFCS blocks a receptor in our brain which signals satiety. I thought she called it the PABA receptor, but I can’t find the research to back that up, so don’t quote me. However, if that suggestion is true, it could help explain why it is possible to eat a whole sleeve of Oreos without feeling full until much later. First of all, the only form of sugar which the body can use is glucose—it recognizes no other sugar as acceptable “food.” Thus, our bodies are equipped with special enzymes that help break down and convert various sugars, ingested in the form of carbohydrate starches, into glucose. When sucrose is ingested, enzymes in our mouth and stomach must break it down into glucose and fructose in order for the liver to absorb the sugar. High fructose corn syrup is already made up of the un-bonded monosaccharides, so no extra digestion is needed in this first step. Glucose is quickly absorbed into to the liver where it is then transported to the tissues of the body. Some is stored in the liver and muscles as glycogen, but most is used as immediate fuel for the brain and other tissues. Fructose, on the other hand, is slowly absorbed, requiring extra help from various enzymes to convert it to usable energy or compounds for storage in the liver. To drive this concept home, here’s what happens in carbohydrate digestion when we eat a piece of whole-wheat bread. Chewing in the mouth combined with salivary amylase helps break the complex starch into glycogen. Down it slides to the stomach where hydrochloric acid breaks it into disaccharides, or sucrose molecules. In the small intestine the enzyme, sucrase, breaks the molecules into the monosaccharides glucose and fructose. Digestion will be slowed here because of the digestion-resisting fibers contained in the whole-wheat bread. This is a good thing, because it prevents blood sugar spikes. Glucose enters the liver where it is then dispersed to the brain and tissues for food. Some is stored in the liver and muscles for later. Fructose enters the liver where it hangs out for a while, waiting to be converted into one of three different compounds: glycogen for energy storage, triglycerides for fat storage, or free glucose for immediate energy. Most converted fructose is used for glycogen storage. What is the big deal with eating too much fructose? It must be clarified here that fructose alone, is a naturally-occurring sugar molecule found in fruits, vegetables, and honey. The unnatural characteristic of HFCS is simply that fructose exists in a higher concentration than what is found in whole foods. There are two major differences in the digestion of foods containing HFCS versus those that do not. First of all, they cause a quick spike in blood sugar since there is no digestion needed for the liver to absorb the glucose and fructose. Second, most foods containing HFCS are not high in fiber, so there’s nothing to slow the digestion in the small intestine. Third, the liver gets overwhelmed with the high ratio of fructose needing to be converted to usable energy compounds. Following, I will explain how science is finding that consuming too much fructose can possibly be harmful. First of all, biology teaches us that if large amounts of fructose are consumed, it can spill into the colon, unabsorbed, and result in intestinal gas and loose stools. Nobody wants to experience that kind of trouble, right? Many studies are being conducted to find the connection between HFCS and obesity. Back to my professors suggestion about HFCS blocking our normal satiety cues. Studies like this one from the Journal of the American Medical Association are backing her suggestion. Researchers are finding that fructose could block blood flow to the areas of the brain which regulate hunger, allowing for overeating. The issues with eating too much fructose don’t stop at just the effects it can have on the brain. Remember that glucose is the only form of sugar the body recognizes as suitable for fuel? If too much fructose is consumed and the enzymes can’t convert it all to glucose, where does the surplus go? It is often stored as fat. In the American Journal of Clinical Nutrition, I found many studies showing various other potential health consequences from too much HFCS consumption–everything from insulin resistance, high cholesterol, and cardiovascular disease to a possible link in liver failure. One thing was common among most studies trying to prove or disprove the adverse health effects of HFCS, and that was its connection to increased calorie consumption. Because it is a preservative, it’s mostly found in processed “junk food.” You might ask, does the HFCS cause over consumption of calories, or does it just happen to be a sweetener used in already high-calorie snacks? Maybe HFCS has nothing to do with consuming too many calories—or maybe it does. If my biochemistry professor was correct, then foods containing HFCS may just shut down our satiety cues, making it easier to overeat. So, knowing what I do about HFCS, what foods do I limit in our home? HFCS is added to many products shelved on the inner aisles of the grocery store like processed breads, snacks, candies, cakes, cereals, yogurts, sodas, sauces, and condiments. Does this mean we NEVER eat candy or drink soda at the Andersen house? No. However, we try to save such things for rare occasions and we don’t eat them on a regular basis. That DOES mean that you will most likely not find products containing HFCS in our cupboards. Products that we eat every day like peanut butter, crackers, bread, and yogurt are carefully selected to ensure they do not contain HFCS, or most other additives and chemicals for that matter. In the end, whole foods grown and harvested from the good earth do not contain HFCS. There’s no HFCS injected into our fresh produce, and surely it can’t be found in my precious tomatoes growing in the garden out back. Thus, if you choose to drink water over soda and cook from scratch with the whole foods that God put on this earth to nourish the bodies He gave us, you will significantly decrease your consumption of HFCS. And you will probably have a better chance at not over eating. Simple as that. 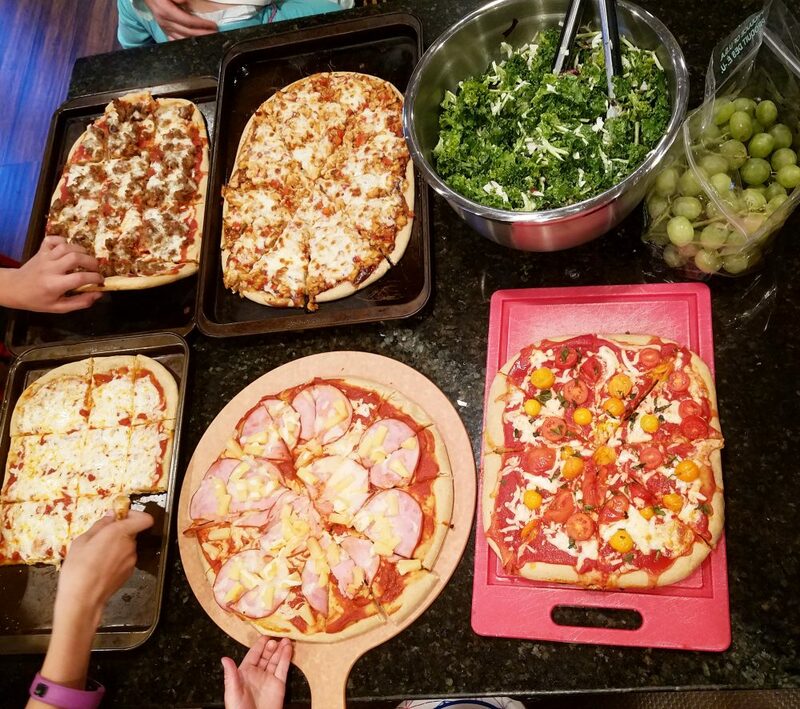 Fridays are pizza night at our house, and we never get sick of it because it is so versatile. We put everything from sausage to squash on our pizzas and we have a lot of fun doing it, too! It has taken me years to finally get the dough right. If it doesn’t turn out just right for you the first time, keep trying! However, this recipe is pretty well tried-and-true, and it’s hard to fail if you are using the Bosch Mixer. Pre-heat your oven to 420°F. This will warm your kitchen and help activate the yeast. Set up your mixer with the heavy dough hook insterted. Grease 3, 12-inch round pizza pans with cooking spray. Sprinkle with corn meal (optional). Add yeast and warm water to mixer and let it sit for 2-3 minutes. Mix olive oil and salt into the yeast water and stir a couple of times. Add half the flour to the wet ingredients and begin mixing on the lowest setting. Slowly add no more than 1/2 cup of additional flour at a time. Once the dough begins to "clean off" the sides of the bowl as it mixes, stop adding flour. Increase the mixing speed to the medium setting and mix for 7 minutes. Grease hands with a bit of oil. Pull out of the mixer three equal portions of dough, shaping into balls, and place in the center of each pizza pan. Using the palm of one hand, press the dough ball into the pan as you slowly spin the pan with your other hand. The crust should fill a 12-inch diameter pan and be about 1/2 inch thick. Doing it this way prevents extra clean-up with having to scrape dough or wipe grease from your countertop. However, if you prefer to use the rolling pin on a floured or greased surface, that works too. Poke several holes in the dough with a fork. This prevents large bubbles from forming in the crust. Pre-bake the crust for about 5 minutes before adding your sauce and toppings. Once your toppings are added, bake the pizza for another 6 to 8 minutes or until the bottom is medium-brown. You can do the rest from here. 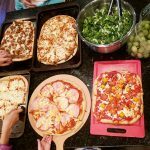 Add the sauces, toppings and cheese of your choice to make your own custom pizza. It will need another 8 to 10 minutes to finish baking. This recipe makes 3, 12-inch pizza crusts. The nutritional information is based on 1 out of the 24 slices this recipe yeilds. Talk about a party in your mouth! These black bean enchiladas should be called “kitchen sink” enchiladas because there’s a little bit of everything stuffed inside them! Topped with a homemade (mild) enchilada sauce and sharp cheddar cheese, these are sure not to disappoint! My six-year-old likes to pack the leftovers for his school lunch the next day. Enjoy! Prepare the enchilada sauce as outlined here. Preheat oven to 350 degrees F. Grease two 9x13 pans. Chop all vegetables into pea-sized pieces. See my chopping tips to speed up this process. In a large, oiled skillet, sauté the sweet potatoes for about 5 minutes on medium-high heat before adding the rest of the vegetables. Add the zucchini, bell peppers, and onion to the skillet and cover with a lid. Let the vegetables cook for about 10 minutes, stirring occasionally. You may need to add a splash of water now and then to prevent the vegetables from sticking to the bottom of the skillet. Meanwhile, cook your flour tortillas if necessary. I use the uncooked variety for it’s additional flavor. Once the vegetables are crisp tender, add the black beans and frozen corn to the skillet. Mix in the lime juice, garlic salt, ground cumin and salt and pepper to taste. Cover and let simmer for 5 minutes. Now you are ready to start assembling the enchiladas. Pour about 1/2 cup of bean/vegetable mixture onto the center of a tortilla. Top with 1 tablespoon shredded cheese and roll it up like a burrito. Place 12 enchiladas in each pan. Top with enchilada sauce and a sprinkle of cheese. Bake, covered with foil, at 350 degrees minutes for 20 minutes. Remove foil and bake another 5 minutes to melt the cheese. If 2 dozen enchiladas is too much for one night, leave the sauce off of one of the pans and cover it with plastic wrap AND tin foil. Pour the enchilada sauce into an airtight container and freeze the enchiladas and the sauce separately for an easy meal later. We like to eat our enchiladas with fresh peach salsa. Also, I use my Instant Pot (aff. link) to cook dry beans. If I didn't plan ahead, canned beans work just fine. However, cooking the beans from dry takes less than an hour in the Instant Pot and saves you some cash compared to the canned beans. Just sayin'. I will never buy canned enchilada sauce again. 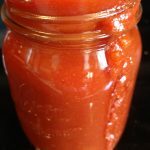 After realizing how easy it is to make my own sauce with even more flavor than the can, this is my go-to enchilada sauce! 1. In a large saucepan over medium-high heat, sauté the onions in olive oil. Add the garlic for the last 30 seconds of cooking. 2. Mix in the spices and cook them with the vegetables just long enough to release their flavors, about 15 seconds. 3. Decrease the temperature to low heat. Add the tomato sauce and chicken stock. Cover with a lid and simmer for 15-20 minutes, stirring occasionally. 4. 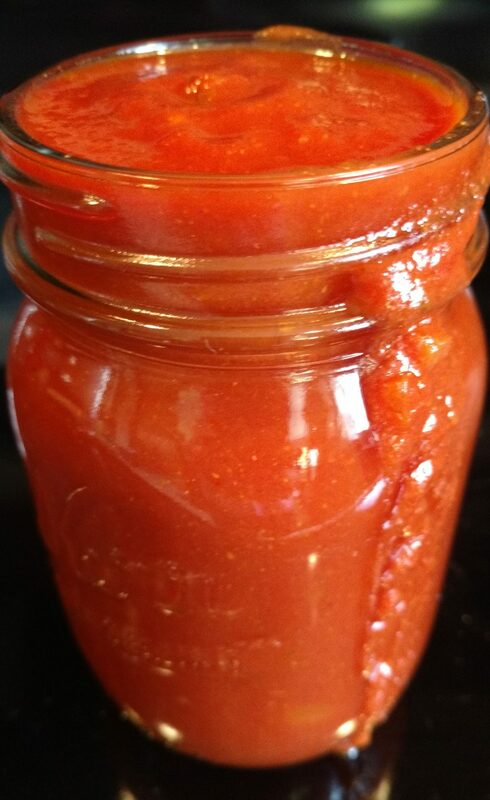 Enchilada sauce can be stored in the refrigerator in an airtight container for up to 10 days. Otherwise, it stores well in the freezer until ready to use. Makes about 3 1/2 Cups Sauce. We have been harvesting peaches off our tree left and right this week! This salsa is a great way to eat a lot of peaches. Use it as a topping on fish, burritos, and salads, or as a dip with chips or crackers. 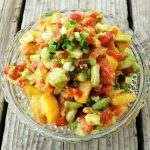 You can also substitue Mangoes for the Peaches for an equally delicious salsa. Think this looks like too much chopping? Check out the notes for my best kitchen hack for chopping all these veggies super fast. Enjoy! 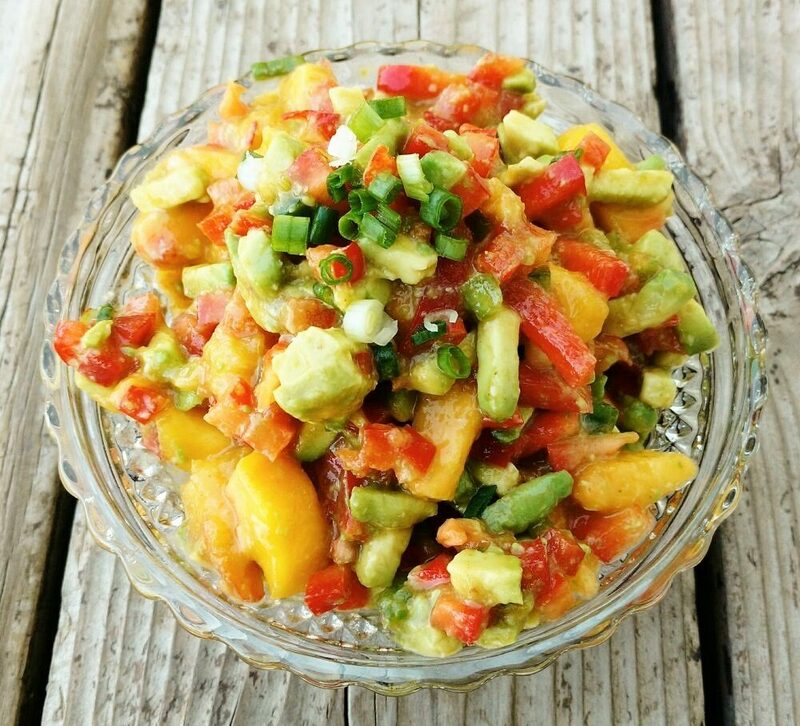 A healthy, fresh, and delicious sweet salsa. Mix in the juice and spices and stir to combine. 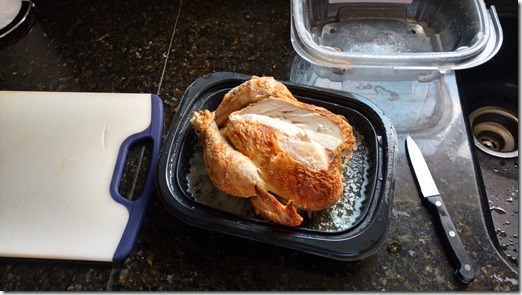 Serve immediately, or store in an airtight container for up to 2 days. 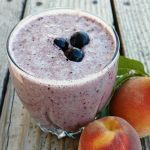 Perfect for a breakfast on-the-go, this smoothie is packed with healthy fats, natural protein, antioxidants, vitamins, calcium, iron, fiber, and probiotics to help you feel energized for the day. You will get your first full serving of vegetables and fruit for the day without much effort. The best part is that it tastes amazing too! Enjoy! 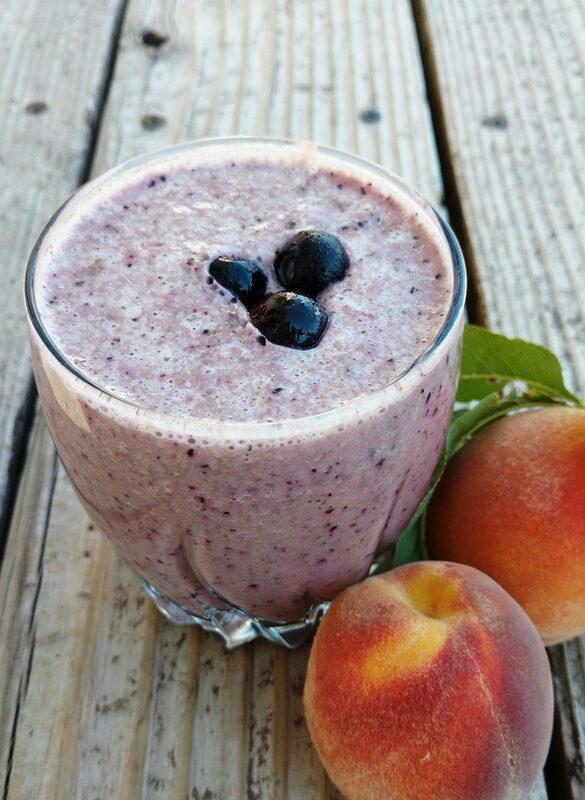 Skip the expensive protein powders and get 16 grams of protein from natural ingredients in this tasty smoothie. Add ingredients in the order listed above. I often use kefir instead of Greek Yogurt for the added digestive benefits of probiotics. It tastes just as great. Are you trying to become your spouse’s personal nutrition consultant? You may not even realize the damage you are doing to your spouse’s relationship with food when you make comments about their eating habits. In Intuitive Eating, (2012) (aff. link) Evelyn Tribole describes a predisposition which her clients call the “Forget You” Diet. When spouses make condescending comments or suggestions to their partner’s food choices, it elicits a feeling of “forget you!” The partner then eats more than they normally would, just because their freedom with food has been violated and they rebel against the suggested restriction. My husband calls this the “Eat-out-of-spite” diet. Early in our marriage, or maybe even our engagement, I distinctly remember a time when we were enjoying dessert together. It was ice cream—our favorite. When he finished his portion and started into the carton to scoop more ice cream for himself, I said something like, “You really aren’t going to eat more, are you? !” With that he took two or three additional scoops and spitefully ate more than he would have otherwise, just to show me that he was the boss of his ice cream portions. What a Rookie-Wife mistake that was! It has been over eight years since that incident (and I am sure many others similar to it) and I am still trying to rescind those statements. It is hard to take back words which should never have been said! I promised myself I would stop making comments about what and how much my husband ate. However, I had not completely made peace with his food choices. Sometimes, in an attempt to save him from overeating, I would eat extra portions of food even if I was not hungry. Now, what good did that do for either of us?! 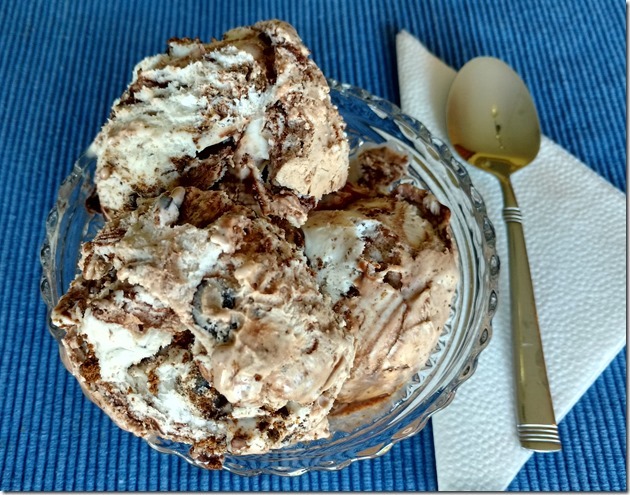 Other times, I stopped making some of his favorite dishes or desserts because they were too fattening in my eyes. I determined to only serve the most nutrient-dense, low-calorie foods as possible. What happened as a result? He ate his comfort foods while he was on work trips because he knew there would be none served at home. Poor guy! It must be hard to be married to a dietitian sometimes! The “eat-out-of-spite” diet continued even though I was trying not to say anything about his food choices. However, what I was doing spoke louder than words. And my actions were not fair. Who gave me the food police badge allowing me to approve and disapprove of what my sweet husband was eating?! In reality, he is quite the disciplined exerciser and eats a pretty balanced diet. Because I had my own problems with letting myself indulge in favorite foods, I took my self-depriving frustrations out on him. So, what can you do to help your spouse make healthier food choices, without eliciting the “Eat-out-of-spite-diet” in them? Here’s my advice (for what it is worth): Do the same which you would for any other guest at your table. You may offer plenty of food options at each meal. Involve them in your meal-planning, and let them choose some of the meals you will prepare. When eating out, you choose your food and let them choose theirs. Leave the rest up to them. Hands off! No comments. No suggestions. 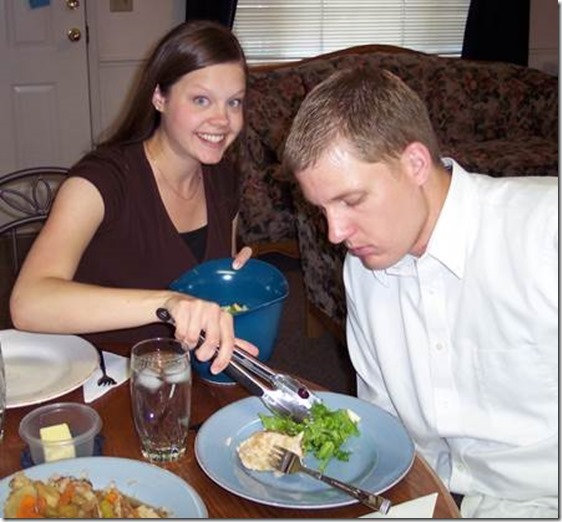 Let your spouse decide which dishes and how much of each they will eat. Then, enjoy the time you have with each other together. You just might be surprised to find your spouse eating much less once you finally let go of trying to micromanage their dinner plate!